One of the challenges of shooting outdoor sports such as skiing and hiking is that you have to carry all of your gear with you on location. So if you don't want to have back ache at the end of the day it is important to travel with lightweight kit. And if you want lighting, that means speedlights. The problem is that speedlights are not that powerful. On a sunny day, it's often necessary to shoot at f/11 or greater in order to keep the shutter speed below the camera's max flash sync speed. At f/11 the range of a speedlight is pretty limited, and drops dramatically once you put it through a softbox. The answer of course it to carry more powerful flashes. But unless you have several assistants, carrying a couple of Profoto 7Bs or Elinchrom Rangers is out of the question. Each pack, head and modifier combo comes in at 15kg+. Elinchrom has tried to fill the gap between speedlights and the more powerful battery flashes with the new Quadra series. 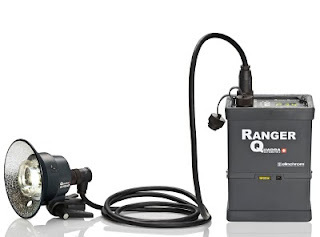 At 400 w/s they are only 1/3rd of the power of the 7B or Ranger, but still approx 5X more powerful than a speedlight. They are also about 1/3 of the weight of their larger cousins, meaning they are a realistic option to stick in a backpack and carry out into the field. I've been toying with the idea of renting some to test them out for a few months now. UK-based photographer Simon Keitch has a review of the Quadras on his blog here. I've been wondering about the Quadra system for somewhile. I saw them at Focus last year and they looked very portable. I'm looking forward to hearing your opinion on them, in particular how useful they will be for your travel work, and what impact it will have on your equipment when boarding flights etc. I'm currently using Speedlights with an STE2 but have just acquired some of the new pocket wizard gear with TTL. Dave - yes I'm tempted by the new PWs as having TTL would be nice. I currently use SB-28s on manual mode but have 3 580EXIIs that I hardly use, as 1) they're much bulkier and 2) I would have to use them on manual with the old PWs anyway! If I do get around to investigating the Quadra's I'll post my experiences here. I'm very interested in these. I have a trip coming up in feb to shoot skiing in japan and im sorely tempted to drop the coin on these for that trip as I need to travel light. I'm planning to hire a couple of these for a ski shoot in Switzerland next month - full report when I get back.